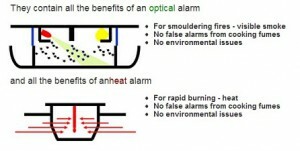 Multi-Criteria Detectors Comprise of two or more sensors within the same housing, integrated by the detector electronics or software to give a rapid response to a broader range of fires and greater immunity to nuisance alarms. 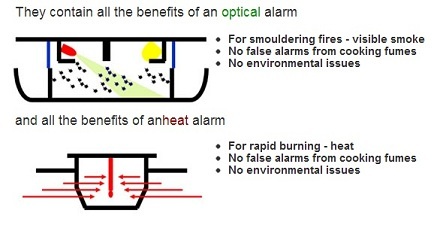 The most common type at present is a combination of optical and rate of rise heat sensors, which can give a response to fast flaming fires similar to that of ionisation detectors. Other sensor combinations are also available. The new Multi-Sensor from EI combines the results of the heat and optical sensors and uses the combined data to give earliest fire protection while giving full protection against false alarms.